TomoWave Gold Nanorods serve as exceptional absorbers of laser light to provide utility in a variety of applications. Current applications include: use in NanoLISA in vitro immunoassays, contrast agents in optoacoustic imaging applications, and leukemia therapy with photoablation. Our nanorod synthesis is carefully controlled and produces unprecedented levels of absorbance at desired light wavelengths. Nanotechnology combined with molecular biology offers abundant opportunities for the development of contrast agents for biomedical imaging with exceptional molecular specificity. 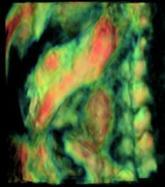 TomoWave based contrast agents are designed for optoacoustic imaging and treatment purposes. TomoWave gold nanorods distribute themselves within the circulatory system of mice after injection and provide large contrast in the periphery. 2-3 days post-injection, the nanorods accumulate within certain organs such as the spleen, liver, and kidneys. In addition, utilizing highly specific molecular targeting, conjugated gold nanorods can be adhered to malignant tumors. Employing gold nanorods as contrast agents enjoys the benefit of low toxicity, allowing longer studies with multiple procedures on the same animal. 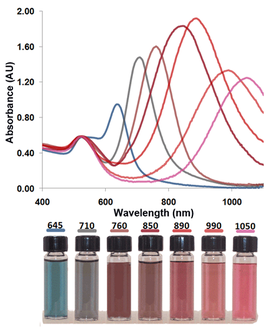 The efficiency and specificity of absorbance for these nanorods are very high and will certainly improve the success and clarity of any preclinical optoacoustic imaging endeavors. 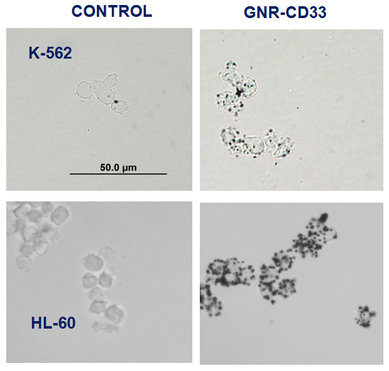 Utilizing gold nanorods conjugated with CD33 antibodies, specific binding to leukemia cells was achieved. Following pulsed laser light, the gold nanorods transferred absorbed energy to targeted cancer cells, causing thermolytic cell death. This photoablative treatment method can be adapted to a wide variety of applications, especially those involving filtration of undesired objects from biological fluids. The image above shows 2D Projections of 3D pptoacoustic Images. Breast tumor receptors were visualized using targeted contrast agent based on bioconjugated GNRs. Before injection of the contrast agent, this mouse tumor was visualized based on its microvasculature. After intravenous injection of Gold NanoRods (GNR) conjugated with PEG-Herceptin, distribution of targeted molecular receptors of HER2/neu in BT474 breast cancer cells became the most contrasted feature. Questions about development of our Gold Nanorods? Please view our presentation below and contact us if you would like more information.